The following is an account of my first official 5K race event that took place on June 9, 2012. 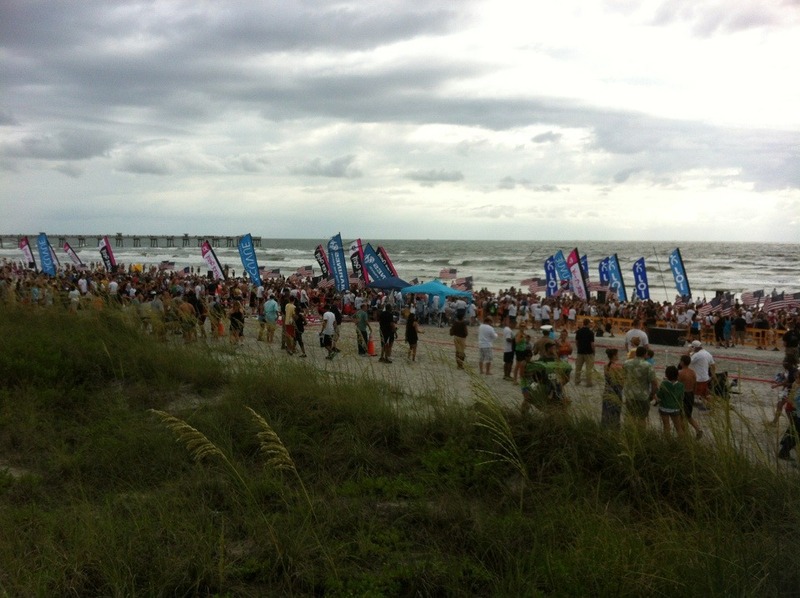 It was called the “Never Quit Beach Fest” and was held in Jacksonville Beach, Florida. This is a monumental moment in my life, and a day that I will never forget. I arrived at the race site at 6:30am. I found a decent parking spot fairly quickly and not too far away. This was my first official 5K race and although excitement ran through my body at that moment, anxiousness and nervousness began to creep in. I had no clue what to expect. The only information I got was from Googling on the internet: Race Day Tips for Running Your First Race and other related articles. I made it a point to commit these tips to memory. I noticed other participants arriving and finding parking spots. I also noticed no one was wearing their bibs. Okay, I don’t want to look like the rookie and stroll out here with my bib already in place, I thought. Good grief, dude… everyone is going to be wearing them anyway. Don’t be such a goober! After convincing myself, I got out of my car and changed into my racing shirt with my bib already attached from the night before—that was one of the tips. I made my way down to the beach which was a block or two away. There was already a lot of people around: some walking in groups, some on their own—like me—and some even jogging up and down the boardwalk. The excitement built up even more as I saw all these people here this early in the morning to do one thing for one reason: to run (or walk for some) because they chose to… they wanted to! As I reached the beach around 6:45am, I saw more people with their bibs on. See, all that stressing for nothing, I said to myself. I woke up at 5:30am and consumed my customary bagel and peanut butter to pre-fuel my body. And of course, I started hydrating earlier too. That means it was about time for some of that to make an exit. I expected long lines and crowds around the Porta-Potties, but I was “relieved” to find that wasn’t the case. I read about how bad these can be at races. Perhaps I got there earlier enough to beat the crowds and the messes that would probably ensue throughout the morning. I took care of business and made my way to the beach. The temperature was around 73 degrees and was extremely overcast. Dark gray clouds covered the sky, and it looked like it would rain at any second. The beach itself was moderately crowded. There were less people than I thought there would be. I figured it was because this was the first of two races. I gathered that this event was so huge, they thought it better to have two races for the 5K events: one at 7:30am and the other at 9:00am. I chose the early race—primarily because I wanted to get in and get it done soon, no waiting around. Maybe waiting would have been a good thing…. Around 7:00am, the rain came down. I kept moving around on the beach: pacing back and forth, taking short walks here and there, and warming up with a brisk jog. There was no way I was going to stand still in this rain. With the wind blowing in from the ocean, the rain felt cold on contact. Ironically the event was called Never Quit Beach Fest 2012… if there was ever a time to quit, it was this one—just kidding. Everyone looked miserable and unhappy. We were getting completely soaked. Most people were huddled together in groups (shivering) trying to stay somewhat warm. I kept moving; this was definitely not the time to be still. I kept moving around—as much as I could in the crowd—keeping my legs warm and active. The last thing I need is to get cold and rigid right at the start. The National Anthem sounded over the PA speakers—which is always inspirational in any event. The rain made yet another appearance, and a unison of soft moans covered the crowd. Not again! Mother Nature must’ve wanted a last laugh because it didn’t last long. The rain stopped. The drumroll sounded. And finally the gun went off… the race had begun! The crowd slowly moved forward at first. It takes a while before the chain reaction of movement reaches those further back in the group. A slow walk changed to a walk, then a short-stepping jog, a jog, and finally a stutter-stepping run. In the concentration of not wanting to step on the people in front of me—and not wanting to get trampled by those behind me—I forgot to look up the clock as I went through starting line. I found out later it took me 23 seconds to reach the starting line after the gun went off. It’s expected that not everyone will adhere to good running etiquette—and I’m sure this happens in every race—but there were some walkers and slower-paced individuals in front of me. As best I could, I weaved my way through the traffic of slower runners. I felt like I was in one of those high-speed car chases you see in the movies as you slow down and speed up and hit gaps in traffic whenever you see an opportunity. I admit, it was a little fun; it got my adrenaline pumping. It also boosted my confidence a little knowing I was faster than others. My ability to transverse through the traffic paid off: I slid to the very high right side of traffic—the beach was on my right, the ocean on my left—and found my stride. My position was perfect. All the runners were on my left and open space (and sand dunes) to my right. In front of me was a clear view of the beach ahead. I don’t like running in the middle of a pack, so this suited me just fine. I found my natural pace and concentrated on my breathing. I tried to ignore the other runner’s for fear of picking up their pace. I didn’t bring my iPhone, and I didn’t listen to any music. I wanted to enjoy the sounds of the ocean, my steady breathing, the rhythm of my feet kissing the sand, and the encouraging words from scattered onlookers. I even heard a few cheers from people on their hotel balconies as we passed by. The earlier rain left plenty of puddles along the way. A few runners took big steps or leaps over them. Some of them made elaborate detours to avoid them. Thanks to the rain, my shoes are already soaked so what does it matter, I thought. I ran through them as if they didn’t exist—of course I made sure the water wasn’t masking huge holes either… that wouldn’t be cool. Hey, I’m not here to finish pretty, keep my shoes dry, or anything like that. I’m here to run and puddles aren’t going to distract me. I dictate my run, not the puddles. I didn’t realize until I got home how sandy I was from the puddle splashing. On my training runs during the week, I can go a decent distance before needing water. But of course with the excitement of being in a race, the dry mouth and thirst is made its appearance sooner than anticipated. I started looking for the water station that should be just past the first mile marker. I spot it ahead—way ahead—and started sliding down to the left side of all the runners. At this point, I passed by the timing clock at the first mile marker, and saw it ticking away… 8:14… 8:15… 8:16. I shook my head and got a little frustrated with myself for not keeping it under 8 minutes. I know I “planned” on an 8:30 first mile, but the competitive side of me jumped in. I took a deep breath and thought to myself, This is my first race, and I’m not concerned with making time. The frustration subsided, and I relaxed. (Don’t forget: it took me 23 seconds to reach the starting line so in truth, I was under 8 minutes on my pace. Needless to say, I felt better about it later.) Oh yeah, water! Being right-handed, it would be natural to take the water on the right but according to my faithful “running tips” I found earlier, they suggested the left side would be less crowded—and it was. I felt like a pro. As the tips suggested, I approached the left side tables, eyed a volunteer from a good distance away to let him know I was coming to him, reached my left hand out early to signal for water, took the cup, and—most importantly—said “thank you” as I ran by. Successful? Not quite, I still had to drink on the run. I pinched the cup at one end to make the drinking end narrow thus enabling a constricted flow of water to enter my mouth. Easier said than done. The cup was plastic and didn’t “pinch” very well. I rushed myself, did the best I could, and took a drink. I choked on the water as it gushed into my mouth. Rookie! Fortunately, it wasn’t too noticeable. I’ve taken water on the run before, but it has always been from a bottle with a spout. I guess it showed. After the short choking episode, I was able to drink a little water and at least wet my mouth. I slid back to the right side so I could dispose of my cup out of the running paths. I easily slipped back into my stride and headed for the turn-around. I was pleasantly surprised at how many kids were holding steady in front of me. It was great seeing them running… encouraging even. The runners at the very front of the pack were already making their way back on our left side. The turn-around is close, I thought to myself. There were kids even in the front pack running past me… very encouraging! As I approached the turn, everyone dipped low and made the tight turn around the cone. Divots and ruts in the sand arced closely around the cone. The woman in front of me had the same idea: avoid the ruts and just circle it high where the sand is still smooth. I wasn’t interested in cutting corners; I just didn’t want to get caught up in the ruts—or traffic. Now, I’m halfway home. I slid to the right of the pack, fell into a good stride, steadied my breathing, and kept my eyes straight ahead—except for the several glances I kept stealing of the ocean on my right. My body felt good; I didn’t start off too fast at the beginning. I believed I saved enough in my tank to make a good run to the finish. I upped my pace just slightly. During the first half of the race, I passed some runners here and there at a steady rate. Now, I was covering some good ground. My confidence (and motivation) would increase a little more as I passed more runners on the way back. If anything, this was the strong part of my run. I was in my groove. With a smile on my face, I stole some more glances of the ocean. What are you doing, sight-seeing? Why yes I am… I’m having fun. Dry Mouth decided to make a return appearance again. The water station was ahead on the left. I didn’t really need a drink, but I wanted to make Dry Mouth go away. I engaged my same format: eyed a volunteer, reached out my hand, took the cup, said “Thank you”, and then quickly thought about how not to repeat my choking episode. I dumped half the water out, pinched the cup, got just enough in my mouth—with no choking—and disposed of the cup out of everyone’s way. It was a success! I was feeling great. I was running on the beach where I first started my running experience. I was running in my first 5K and doing quite well. Three months prior, I would have never imagined running a 5K race. My “runner’s high” was definitely kicking in. Then, I hit that moment… that point in every long run when the autopilot turns on and the machine takes over. My mind gets freed from thinking about pace, time, stride, breathing, pronation, and form to just… simply running. And at that point, it’s not like running at all. It’s more like flying… running my stride on a plateau of air because it becomes so effortless. I’ll admit, it was difficult to fight back the temptations to dig as I entered the last half mile, but I managed. I wanted to put up a good time—especially for my first race—but, moreover, I wanted to simply enjoy this one without my competitive nature butting in. I wanted to stroll through the finish line like this was just another leisure run. And, I did. I continued to scroll through even as a runner zoomed past me in the last 20 feet. I felt the competitive tug to “race” him to the finish but instead relinquished the urge. I crossed the finish line, heard my timing chip cause a beep, and—like the tips offered—kept running to clear the way for other finishers. Volunteers were there handing out bottles of water. Yes! I’m sure not to choke this time! I eyed one of them as he called me “Big Red”, probably because of my bright red running shirt I was wearing. I took the bottle, said “Thank you,” and followed the crowd ahead to collect my finisher’s swag (a pair of really nice sunglasses). One of the features of the event was to write on your bib who or what you will never quit for. Before and after the race, I tried to—nonchalantly—look at what others wrote on their bibs. Some were left blank but others said the usual: mom, dad, my family, my kids, or had someone’s name. Some were even a bit humorous: small dogs, endless beer nights, etc. For me, I needed to stay true to my reasons. This event holds a great significance for me. Not only for being my first race, but for what this event represents… never quitting. On my bib, I wrote the only thing that I could: MYSELF. Selfish? Maybe, but I have to be honest. I’m the only person I can never quit for or quit on. I have to believe in me… I have to believe in who I am… believe in my abilities… believe in my possibilities. I do it for me. I’m the first and last person that doubt and unbelief will cross before I would ever give up… so the choice will always be mine. And that’s a choice I never want to make. If I ever quit on myself, I could never be any use to anyone else. And someday… somewhere, someone will need me to be there for them. This entry was posted on Tuesday, June 12th, 2012 at 4:13 pm	and tagged with 5K, beach, beginning, experience, firsts, nonfiction, race, story, thoughts and posted in Excerpts of Life. You can follow any responses to this entry through the RSS 2.0 feed.